Over the last two weeks I've been busy with and then recovering from getting work ready for accreditation. Thankfully we passed and I can get back to focusing on the important things; you know reviewing beers and the like! The Lindemans Faro I'm having tonight is actually the first Faro I've ever had. I had to acquaint myself with the style earlier as I wasn't sure what to expect. Basically it's a blended lambic which then has candied sugar added. This is supposed to dull the sourness and make it more palatable to the average drinker - sort of an entry beer into sours... I'm really interested to see what it tastes like. Firstly; apologies for the picture quality. Not sure why none of them turned out well... The pour was an interesting colour, I'm not quite sure what to call it - deep golden, light amber, the same as my bar top... You get the idea anyway. The head was slightly off white towards the cream spectrum and was quite short lived. There did appear to be plenty of carbonation however, so why it is so short lived I'm not sure. Like most members of the lambic family it's not a great looking beer, but it is interesting. 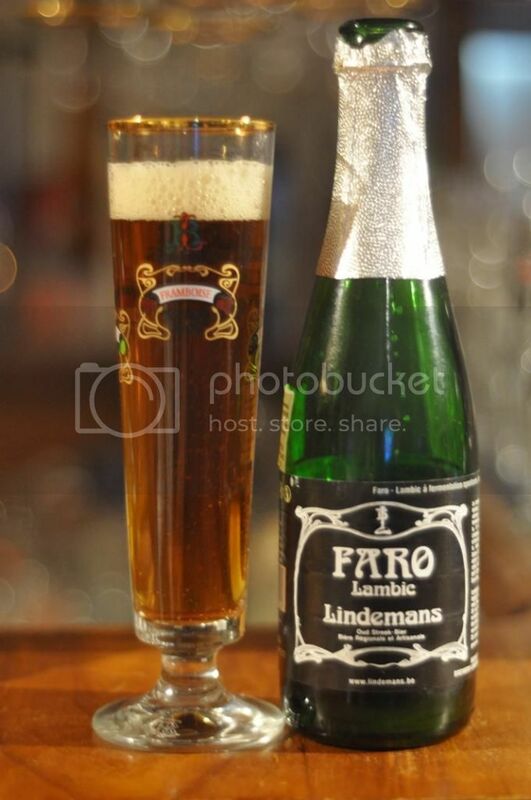 Lindemans Faro has two vastly different elements on the nose, that somehow work together despite being polar opposites. The two elements are the sourness that you would expect from a Belgian lambic, although it is certainly muted, and very sweet candied sugar. It's an odd aroma - the sweetness is definitely dominant although the sourness comes in waves and is certainly present. Having never had a Faro before I was unsure what to expect and how to rate this stylistically. There is plenty of sweetness throughout, coming from the candied sugar added to the lambic blend. I also pickup some fruitiness, although it is muted and almost indistinguishable. Hidden away amongst the sweetness was the barnyard funkiness that I was expecting more of. It's quite restrained and not as plentiful as I'd like in a sour - although being a Faro I suppose it's right for the style. My first Faro was certainly an eye opener to the style. It's not something I particularly enjoyed, but neither was it something I detested. It's place is quite clearly as a gateway beer from more widely available Belgian styles of beer into the world of sours. The sourness is present but certainly not dominant or overpowering. I would recommend this to beer drinkers looking to get into sours, it's very moderate though - full-on sours are much more intense!